Hello Bitcointalk community this is the pre-annoucment thread for RPG coin, we will update the ANN throughout the next few weeks while we run a closed beta of the RPG testnet. Later when ready to list on an exchange we will post the source code, wallets, mining pool, explorer and other important links and updates. RPGcoin is built on a fork of the Ravencoin code. Key changes include a block reward, a change in the number of coins issued, but not the weighted distribution schedule and the addition of asset creation and messaging capabilities. RPGcoin is free and open source. RPGcoin (RPG) can be mined publicly and transparently using Proof of Work (POW) using the x21s algorithm. 50 million (less than 0.24%) from the maximum total supply of 21 billion RPG have been set aside for crowd funding, private investors, public bounties, founders, and developers. 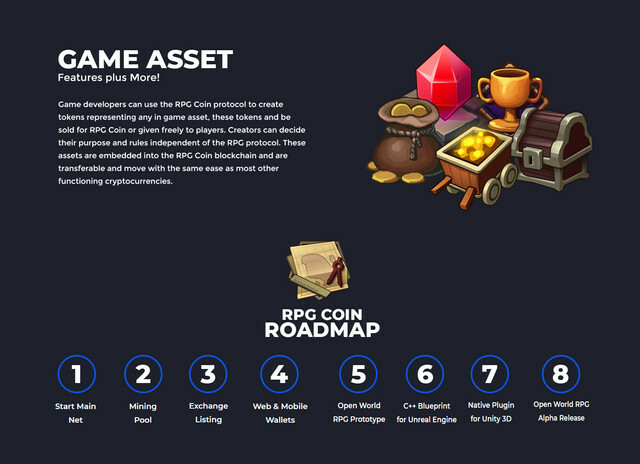 RPGcoin is a blockchain and platform optimized for indie game developers for transferring in-game assets, such as tokens/currency, virtual real estate, and unique items game items such as armor, weapons or anything game devs can imagine. "It’s dangerous to go alone, take this!" 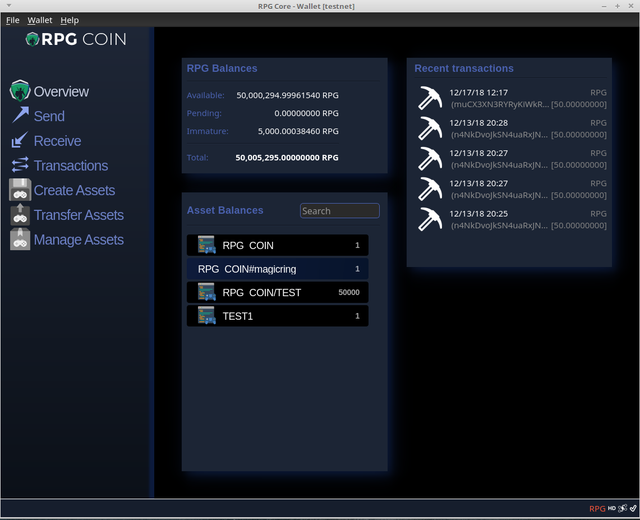 The RPGcoin wallet provides a single native client to create, issue, track, and transfer game assets. As a cryptocurrency RPG provides a market value to game assets providing additional value for developers and players alike. * Collectable items such as rare or unique skins. * Power your entire in-game economy. * In-game currency and items, transferable out of game to outside marketplaces. * Rare or unique items like magic swords, armor, spells or other role-playing game items. * Loot boxes for any game type. * Virtual real-estate and other player 'ownable' items. * Imagine a game developer issues the asset named ARMOR. The developer can then make unique ARMOR assets by attaching a name or a serialized number to each suit of armor. These unique tokens can be transferred or sold to the player. The tokens ARMOR:Golden and ARMOR:Silver are not fungible and represent distinct pieces of armor. Since Armor:Golden is 100% unique only 1 lucky player will be able to own that item. * These in game assets could then be kept, traded with other players via QR codes and wallets or traded with NPC merchants for other items or in-game currency . Game Assets are issued directly from the RPG wallet using either the gui wallet or cli commands. The game assets represented as tokens exist on the RPG Coin blockchain and are transferable by simply sending the token(s) to a valid RPG address. "ItÂ’s dangerous to go alone, take this!" Last edited by Elainep; 02-03-2019 at 11:13 AM.